Project Name: RAF Museum brand identity and signage & wayfinding strategy. 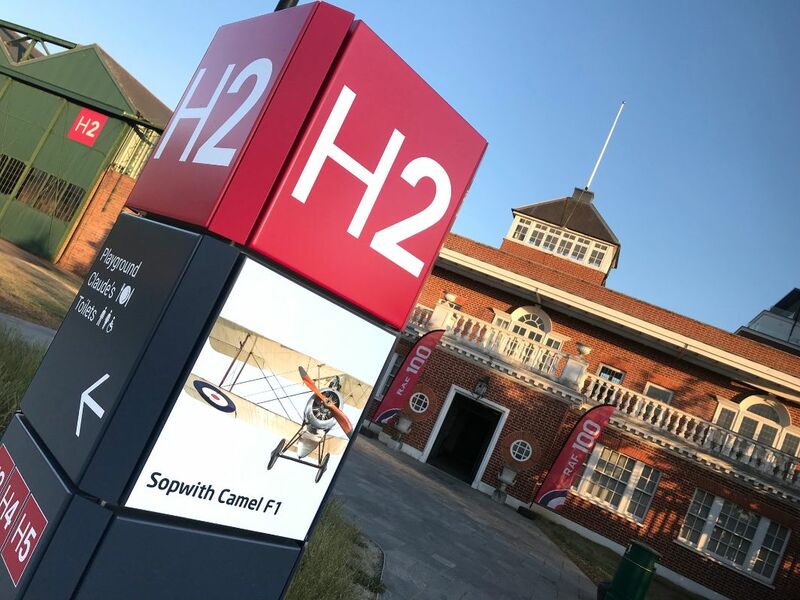 Role: ABG Design were commissioned by the Royal Airforce Museum London following a competitive tender to create a new brand identity and signage strategy for the historic Hendon site. The scope of work included: design of a new sub-brand identity for the Hendon site (in London) and the Cosford site (near Wolverhampton), new positioning for the sub-brands, headline and secondary fonts, colourways and user guidelines. Also, a rationale and audit of all existing signage with and creation of a new wayfinding strategy, site orientation map, specifications for manufacture and overseeing installation. The Brief: ABG Design were commissioned to produce a new style guide for all communications at the RAF Museum to work seamlessly across both the physical and digital applications. Phase 1 of the project involved an evaluation of the current communications and proposed new positioning to include typefaces for information signage, print and digital applications. The new sub- brands required a simple to use ‘tool kit’ that could be applied to all communications and and also had to work side- by-side with the established RAF Museum brand. Phase 2 of the project required the application of the brand positioning to the signage and wayfinding ensuring visitors had a welcome and enjoyable experience with accessibility to all areas of the Museum’s exhibitions, exhibits and facilities. One of the main challenges involved creating a connection between the large hangars that were from different periods of history with varying architectural styles and materials. Outcome: Our process involved a review of all the Museums communications and potential new applications for the new sub-brands and involved a client team workshop to evaluate the new creative positioning. A new and distinctive ‘family friendly’ typeface ‘neo sans’ was chosen as a headline font for all communications and top level signage while a secondary font ‘Roboto’ was chosen as an information font with good legibility across signage, print and digital applications. Simple, bold iconic profiles of historic aircraft, including the Spitfire, were used as inspiration for the sub-brands and were applied to a series of wayfinding banners leading visitors from the main underground station to the Museum entrance. The signage, based on four sided totems, means information can be located effectively within the landscaping without the need to fix to the listed buildings. It was designed to be bold and practical, with a ‘utility feel’ and graphics reflecting imagery seen in aviation. The signs were designed to be intuitive for visitors, being large and visible from each hangar on site, with tactile signs for amenities to aid accessibility. We have added inspirational images within the signage of key exhibits that can be interchanged on a modular system when exhibits are updated. Also modern materials were chosen to give the signage a contemporary feel and give longevity. To help integrate the wayfinding information a new schematic illustrated map of the site was produced by ABG’s inhouse illustrator which includes information for visitors to plan their day. Case Study Submitted by ABG Design, Chris Hubert Creative Director (chubert@abgdesign.uk.com).